The Sony Xperia SP is equipped with an 8 megapixel camera that can produce still shots with a maximum resolution of 3264 x 2448 pixels. However, if you use the default Superior auto mode, you only get 7 MP 3104 x 2328 shots instead. The difference between the Superior auto mode and regular mode with all settings set to auto is that the first tries to guess what kind of scene you are trying to capture and adjusts all settings accordingly. This includes color saturation, contrast, metering mode among other things. The regular auto mode only sets the exposure automatically, but lets you fiddle with the other settings if you prefer. The good news is the Superior auto mode also tells you what it guessed so you can easily intervene if it gets it wrong. From what our experience so far shows, though, it gets things right almost every time, so unless you are a photography enthusiast or just have to have that extra megapixel of resolution, you're probably better off sticking to Superior auto. The camera interface consists of two panes. The right one holds four virtual buttons - a shortcut to the gallery, video and still shot shutter keys, and a primary/secondary camera toggle. On the left you get the shooting mode selection key in the top corner, followed by three customizable shortcuts. The final shortcut here opens the drawer with all available settings for the given shooting mode. Naturally, the Sony Xperia SP camera offers all kinds of features, including face detection, smile shutter, geotagging, touch capture and HDR mode. This might come in handy for those occasions when you are worried that you might miss a shot, but don't want to waste your battery keeping the camera interface constantly going (it's a real battery hog). As far as actual output is concerned, the Xperia SP camera gives you generally oversaturated colors, with average dynamic range and good contrast. The oversaturation is particularly pronounced on the red channel, resulting in occasional clipping and red objects coming out pink. More importantly, though, the Xperia SP sensor resolves an unsatisfactory amount of detail and produces pretty noise images. If you switch to the regular auto mode, you get images that appear slightly more natural without that overprocessed look. This gives you more headroom if you plan on post-processing your images, but resolved detail doesn't change significantly, so the output is still far from great. 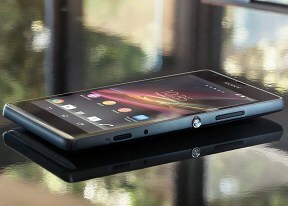 The Sony Xperia SP challenges the other 8MP shooters in town in our dedicated photo comparison tool. The blown out red channel is very prominent in our color poster, and the quality of the images under artificial lighting is among the worst we've seen from an 8MP shooter.